For as long as I can remember, whenever I liked something, I really really liked it. There was and is no "kinda like it" in my world. I throw myself into it. I think about it 24-7 and find it difficult to drop and walk away. So far this winter, my addiction has been this stupid blog. I've poured my heart and soul into this personal project figuring out ways to get more readers. It's kinda worked. I've gone from about fifteen hits per day back in September to 200 hits yesterday (200 hits in one day is a record for me). I need to slowly, somehow get my life back and find a job. It's 11:30 and I'm in my PJs with only four hours of sleep. Last night I decided to catch up on the 1000 blogs I'm following and only managed to send out two measly resumes. Here are a few of my addictions, then and now. 1. ET, Footloose,The Goonies, A Christmas Story and Rushmore - all movies I had to see like at least 100 times. 2. Morning Star Farms everything. I'm not a veg, though I wish I was. One summer I was so addicted to Morning Star Farms Grillers, I found myself having one for breakfast, lunch and dinner steadily for about six weeks. Surprisingly, I don't hate them today, but I've moved on. This past summer I became addicted to Morning Star Farms Hickory BBQ Riblets. It was scary. I bought about six boxes of them within a two week span. We still have one box left from that time period. From there, I discovered their veggie cakes and those I just can't have around me, I can honestly eat an entire box in one sitting - its very carby and delicious. 3. 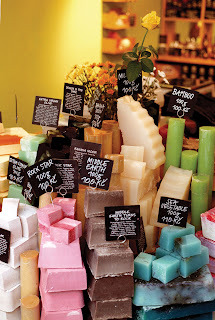 LUSH bath and body products. My obsession with LUSH began in 1998 while working at at teen magazine. I read an article in a women's mag about how Leo DiCaprio loved LUSH products. At that time I was the associate editor of SuperTeen magazine (yes that was the real name of the mag). We were writing lots of articles on Leo and Titanic. I worked with LUSH to include a giveaway of ten baskets of LUSH goodies. I was in heaven! I fell in love with LUSH. I loved how you could soak in the tub with a luxurious bath bomb and your entire apartment would smell like flowers or candy. Sadly, in the late '90s, none of these items were available in the US. I began placing orders from Canada and each time a family member crossed the boarder (my uncle is from Canada) they would bring home bags of "Rock Star" and "Honey I Washed The Kids" soaps and Daddy-O and Ibiza shampoos.I'm still addicted to LUSH. Our bathroom is full of soaps, shampoos and other deliciousness. 4. 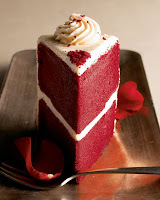 Red Velvet anything. Our wedding cake, any cake, ice cream, shampoo, lip balm, if it's red velvet - bring it on! 5. Boys. I knew I was always boy crazy, but wow. Reading old diaries, they're filled with obsessive talk about this kid and that kid. It's almost unnatural. I wish I had focused on things that mattered like school work and family. Pages of journal entries about the boy of the moment. Many of which I don't even remember. Different kids I had met up with at Hot Skates or at the mall. I wish I had captured more family and friend moments. I'm with you on the LUSH addiction. Their stuff is fabulous. They make the only creme that I can us on my face without breaking out. Current obssesion - Cooking! Atm collecting old family recipes to try out. I really had no addictions -- don't smoke, don't drink much, don't have loyalty to any brand or beauty products. I suppose my addictions are to saving money and blogging, at the moment. Sadly, I'd rather work on my blog (not making money there) than do paying gig work.II need to change that! Since you have the soap obsession, have you ever tried making soap? It's really fun. One of my many obsessions is with essential oils. I love coming up with different blends for things like soaps and oils. @Theresa - yes, everything they make is all natural! That must be why! @Ava - yes, I love Yankee Candles! Very strong scented - love 'em! @TS - I'm sorry, I need to try to be less girly. I'd love to make my own soap! Maybe I should take a class. I feel your pain on number 5! I mean, I don't have old journals to look back on but I don't need to, I remember it well enough. I wish instead I'd been one of those geeks at school who blossoms later on, by which time they've worked hard and got good grades, excellent jobs and are NOT jaded.